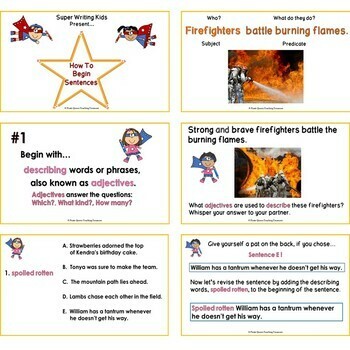 Sentence Fluency Plus Mini Poster FREEBIE! Ahoy mateys! Generally speaking, pirates spin great yarns. They know how to hold their audience's attention with details that are organized to enable the readers or listeners to follow along. They use language that is rich and paints pictures in the minds of the audience. Also the yarn spinners' sentences have a natural flow making the story easy to follow and enjoyable to hear. 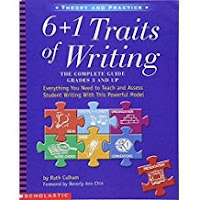 What I am describing may remind you of the Six Traits of Writing which resulted in the research of Ruth Culham and Education Northwest. The traits are Ideas, Organization, Voice, Word Choice, Sentence Fluency, and Conventions. For me teaching writing became a pleasure when using the Six Traits model. In this post, I will share instructional ideas on one component of the Sentence Fluency trait. Sentence Fluency is described as "smooth, rhythmic, easy to read" (Creating & Recognizing Quality Rubrics CD Copyright © 2006 Educational Testing Service). Think about a flowing river or stream. It is constantly moving. However, in some locations, the water moves slowly and quietly. While in other spots, the water rushes and cheers loudly. Sentences within a story have a similar movement. Some are short and sweet. Some are long holding you in suspense. Put them together and you have a flowing narrative. If you take a closer look at sentences that are "smooth, rhythmic, and easy to read", you will see that they begin in a variety of ways. One reason for varying the start of sentences is to connect an idea from the previous sentence to an idea in the sentence that follows. 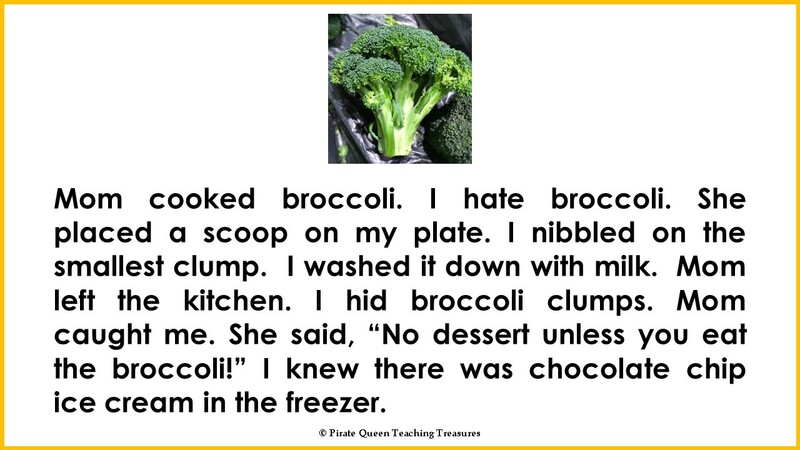 In addition, starting sentences differently prevents choppy sentences and sentences that repeatedly begin with a simple subject which becomes boring after a bit. 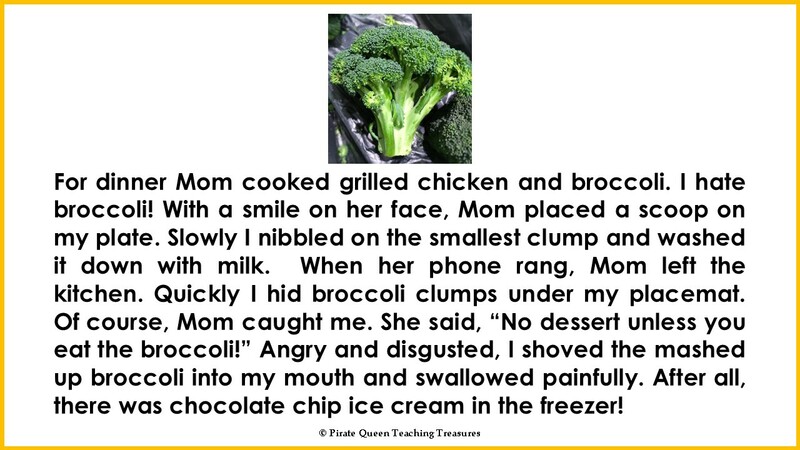 Take a look at the "Broccoli" paragraph. All of the sentences begin with a simple subject, and most are short and choppy. Now, let's read the revision. Did you find the sentences more interesting and detailed? Did the sentences seem to flow more naturally? Did you notice that the sentences vary in how they start? Some begin with prepositional phrases. 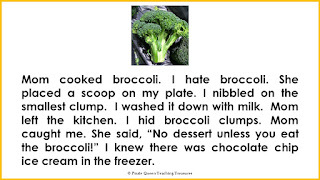 A couple are introduced with adverbs and one with adjectives. Two sentences remain the same and begin with the simple subject. Begin with one or two adjectives describing the subject. Begin with a "how" adverb such as "slowly". Begin with a "where" adverbial phrase such as "in the closet". 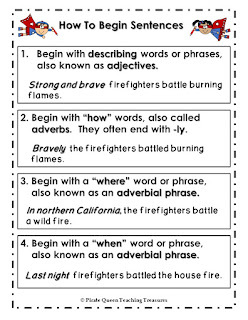 Begin with a "when" adverbial phrase such as "last night". 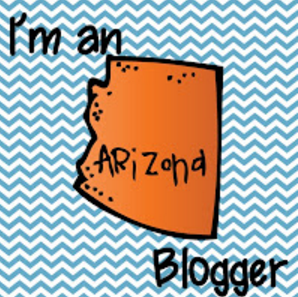 This mini poster is available as a FREEBIE! In addition I created a PowerPoint with engaging and interactive slides to teach these four beginnings. Sail to my store to preview the PPT and mini poster by clicking on the product covers below. If your students need practice with Fragments and Run-on Sentences, you may be interested in this treasure! One more gem before you sail away! You will find on the side bar a link to a Pinterest board I have created for mentor picture books to help you teach sentence fluency. Thanks for visiting! Please come again when you are looking for more teaching treasures!